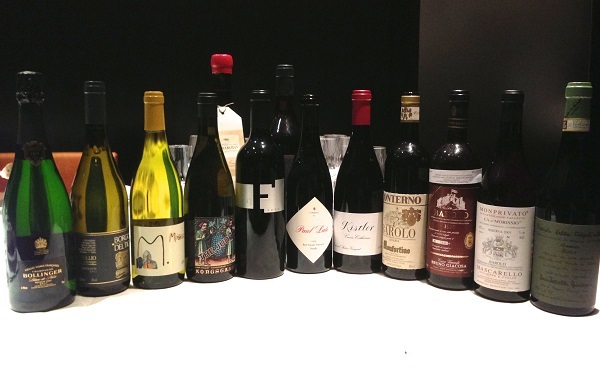 This recent dinner at Ai Fiori provided an opportunity to check in a number of cellar favorites, both old and new. I take a look at some of the wines in this short video, shot just before dinner. Over the last year Ai Fiori has become one of my favorite spots in New York. The food is incredibly wine-friendly, the service is superb and overall ambience is welcoming. Everything on our menu is out of this world. The flake crudo, covered with a nearly obscene amount of caviar, is delicious. The flavors are intense, but not overpowering. 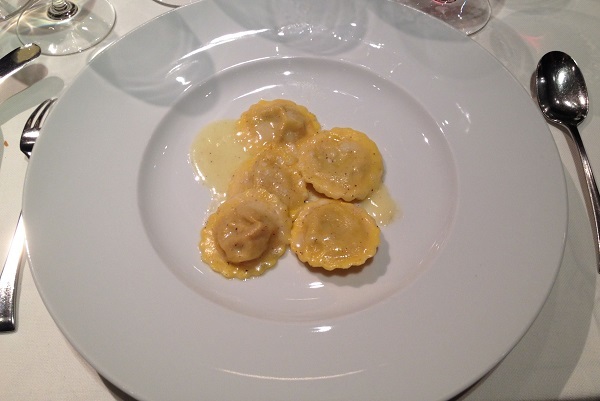 I also love the pork shoulder ravioli, which are rich yet not at all heavy. 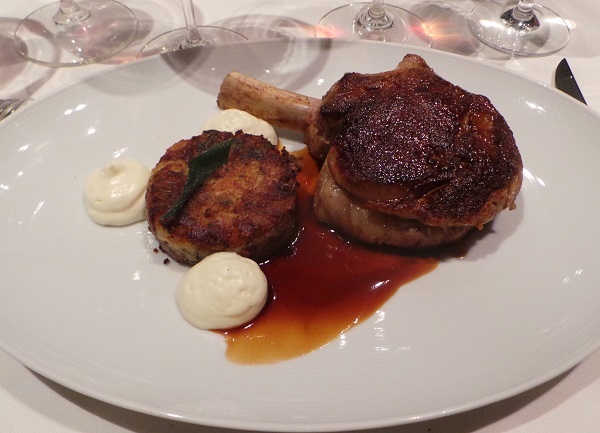 Veal chop is one of my favorites dishes. Ai Fiori’s version is fabulous, with intense flavor and texture that marries beautifully with our wines. I confess I have a weakness for Bollinger’s 2002 Vieilles Vignes Françaises, which I always look forward to drinking. On this night, the VVF is superb. Seamless, resonant and inviting, the 2002 VVF captivates all the senses with its exceptional balance and total class. The 1996 RD is surprisingly fresh, vibrant and beautifully expressive. This is one of the best bottles of the 1996 I have ever had. Our flight of whites is extraordinary. All of the wines pair beautifully with the flake crudo, each in their own way. Miani’s 2011 Friulano Buri is the most textured of the wines, both because of the vintage and its youth. Still, there is plenty of Buttrio minerality underpinning the fruit. Enzo Pontoni’s wines usually need a few years to come together. We drank this wine too young, but it was still beautiful. Varietal Sauvignon notes scream out of the glass in Borgo del Tiglio’s 2011 Sauvignon Selezione. 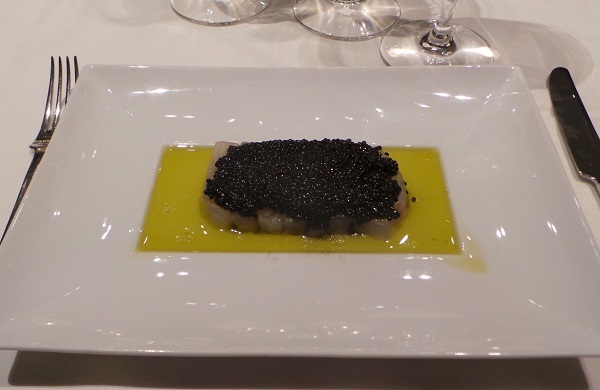 Here aromatics and minerality cut right through the richness of the caviar. What a gorgeous wine this is. Kongsgaard’s 2005 Chardonnay The Judge is absolutely stellar. This bottle is even fresher than a bottle I had a few months back. Readers who own the 2005 should be thrilled. This is one of the best-ever vintages for one of California’s most iconic Chardonnays. Steve Kistler’s 2009 Pinot Noir Occidental Station Vineyard Cuvée Catherine is a drop-dead gorgeous beauty and a huge crowd-pleaser. Today, I have a slight preference for both the 2010 and 2011, but the 2009 is fabulous for its immediacy and juiciness. Paul Lato’s 2009 Syrah Il Padrino Bien Nacido Vineyard appears to be going through an awkward stage, as it is less expressive than normal. Over time, the 2009 opens up a bit, but I am going to wait at least another year before opening another bottle. Much the same is true for the 2009 Futo Proprietary Red, which remains incredibly primary and unevolved. There is a lot to look forward to here, but the wine’s best days are off in the future. Bruno Giacosa’s 1990 Barolo Riserva Collina Rionda is superb. Laced with the essence of dried rose petals, anise and hard candy, the 1990 is a total turn-on. So much so that we go through two bottles without any problems. The 1990 might not reach the celestial heights of the 1978, 1982 or 1989, but it comes awfully close. The 1985 Bartolo Mascarello Barolo, from magnum, is delicious, but also rustic and a bit rough around the edges. I have had the 1985 several times recently, and I am starting to think the wine has begun its move towards full maturity. Scavino’s 1985 Barolo Riserva (magnum) is a real rarity. I have never seen this wine, much less tasted it. For four vintages in the 1980s Enrico Scavino made a Riserva from a rented vineyard in Bussia he subsequently lost access to. The 1985 was the first vintage and it was bottled only in magnum. As fate would have it, our bottle was corked! I hope to have a chance to taste the 1985 Riserva again, but I know that will require a good bit of luck. A stellar flight of Monfortinos rounds out the red. The 2001 Barolo Riserva Monfortino shows just how much finesse and total elegance this great site in Serralunga is capable of. The 2001 boasts striking inner sweetness and more than enough depth to drink well for several decades. Today it is simply magnificent. Conterno’s 1993 Barolo Riserva Monfortino is a more rustic, earthy wine laced with ferrous notes, iron, minerals and smoke. The 1993 remains powerful and brooding. My sense is that the 1993 will be a relatively early maturing Monfortino that is also likely to remain a bit rough around the edges. Over the last two decades Monfortino has become a much more polished wine, as these two vintages poignantly demonstrate. Quintarelli’s 2001 Recioto is a marvelous conclusion to this delicious dinner. Impeccably layered and sensual on the palate, the 2001 brings back so many memories of tastings in the cellar and of the time I was privileged to spend with Giuseppe Quintarelli, the master of Amarone.